This feral lady came from Horseheads, NY. She is one of 20 feral cats being fed on an elderly woman's patio. Her two kittens were rescued at roughly two weeks of age, which saved their lives. 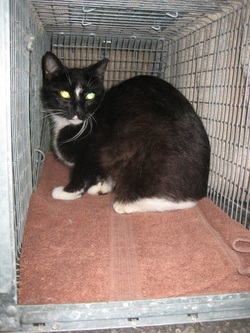 (A day and a half after being taken in by Browncoat Cat Rescue, Tuxedo Jack's eye ruptured. Without surgery, he would have died.) She was spayed, vaccinated, and returned to familiar surroundings.